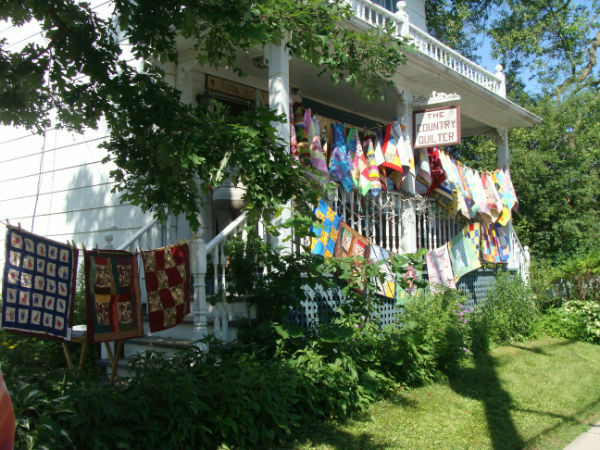 In September of 1992, the The Country Quilter relocated from Manotick to Richmond and is now situated in one of the community’s well-known century residences. The shop is carrying on a commercial tradition for the heritage building at 3444 McBean Street, Richmond. Records of the property date back to 1832, and the shop was recently part of the Richmond200 celebrations! The building has been a post office, a shoemaker’s, a tailor’s and an undertaker’s. Under the ownership of Ann McLean the house has returned to its commercial use after 40 years as a private home. Ann has endeavored to return the house to its previous appearance by building a front veranda and putting up a picket fence. The shop has a cozy atmosphere – just right for quilts and quilting. There is a fireplace in the main room and a large sunny classroom on the main floor. The kitchen is a source of coffee, homemade soup, and the occasional pot luck lunch for the “finishing school group”. The Country Quilter staff has a combined quilting experience and expertise of over 60 years. Ann McLean and the knowledgable staff are ready to help you with all your quilting needs. Formerly a Home Economics teacher specializing in sewing and fabric arts, Ann has been quilting and teaching others this addictive art since 1972. She has been a member of the Ottawa Valley Quilters Guild since 1981, and helped organize the start up of the Richmond Area Quilters Guild. An experienced quilter, Lynn introduces starting quilters to the world of quilting in the Beginner class. She ensures both new students, and those wishing to upgrade their skills, learn fundamental technical skills necessary for piecing patterns. She also teaches a variety of other classes including the Stitching Club, McKenna Club, and leads the Knitters Group! Lynne is known as our Stitching Queen. She leads the monthly meetings of the ‘Not so Serious’ Stitchers and the Knotty Girls. Lynne is a versatile quilter with a passion for all things quilting. As well as teaching stitching she also teaches bags, applique, novelty projects, hand quilting and mostly anything else requested. Guaranteed to learn a lot from her classes, and guaranteed to enjoy every minute! Deborah has been on staff since she retired from her day job. “This is way more fun!” She is an experienced quilter, capable of assisting customers with fabric and quilting decisions. Sarah Jane is our resident long arm quilter. She is available to meet with you about the patterns and threads for quilting your quilt. She has prepared a guide line for preparing your quilt to be long arm quilted. Sarah also works in the shop and has fun helping quilters make fabric choices for their projects. Sarah also makes baby quilts to order. Peggy is extremely knowledgeable and eager to share her passion and expertise in many crafts, including (but not limited to!) quilting, doll making, and wool applique! She is often seen organizing special events in the store, and decorating! A relatively new addition to staff, Sue is a self proclaimed ‘newbie’ to the quilting world. She does bring an eye for colour and perspective into her work, and is thrilled to be ‘working’ in such a creative and supportive environment! Linda is our Wool Applique specialist! She provides instruction, supplies, materials, kits, a great sense of humour, and a true love of wool applique to each and every class. Watch for her classes coming up! Grace is a very talented long arm quilter, and our resident landscape enthusiast! She provides coaching, instruction, and many opportunities to learn the latest techniques in landscape art. Watch for her workshops! Beth calls herself a Domestic Goddess!! We are fortunate to occasionally have Beth on our team. She teaches a wide range of classes. She is a talented quilter, pattern designer, and a super teacher. She also reviews quilting books for The Canadian Quilter magazine. You may find Tracy helping out with special events, and teaching. Her series of Material Girls classes helped quilters to use up their stash (or not!). Tracy has been quilting for almost 25 years. She is past president of the Richmond Area Quilters Guild.